Hi there Doodlebugs! It's Mendi here and I am super excited to be sharing my latest project with you today. 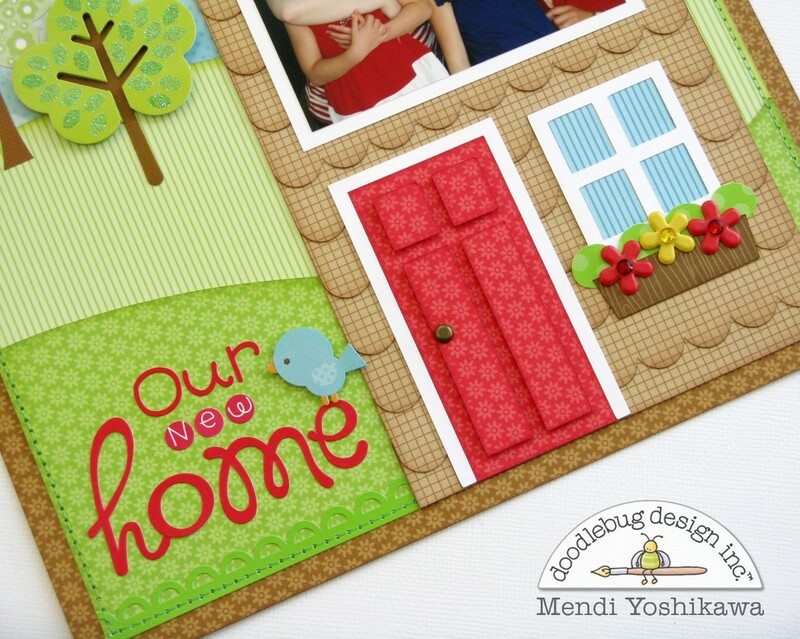 Our challenge was to find a Doodlebug project that inspired us on Pinterest and as soon as I came across this "Welcome Home" layout by Doodlebug's Tonya Prawitt I knew I had found a winner! Isn't it clever? I have been slowly working on a smaller 8-1/2 x 11 album about the building of our new home and when I saw this layout I thought it would be perfect adapted as a cover page for my book! I have a general color theme going throughout my album with browns, blues, reds and greens so I did my best to pull colors that would tie in with this. It was seriously so much fun shopping my stash for just the right elements from so many different Doodlebug collections! To create my little house I adapted THIS cutting file by Samantha Walker from the Silhouette store. Knowing I had more vertical space to work with, I elongated mine to become a two story house. For my siding I cut out 15 scalloped borders (sized to the width of the house) and used a bit of chalk ink along the edges to make them stand out. Love how this turned out Mendi!!! Great idea for the siding... So clever!!!! OMG this is just too adorable!! LOVE your inspiration and LOVE your layout too - WOW - EVERYTHING about it is SO HAPPY, from the precious photo to the front door and every layer in between!! !